The popularity of the Hobo Nickel Silver Round Series has only grown since its beginning. Each of the rounds in this series is designed by Mr. The and he showcases his different designs for the Buffalo Nickel. The final release in the series is the Jefferson Skull design. The 1 oz Antique Silver Jefferson Skull Rounds are now available at Silver.com. 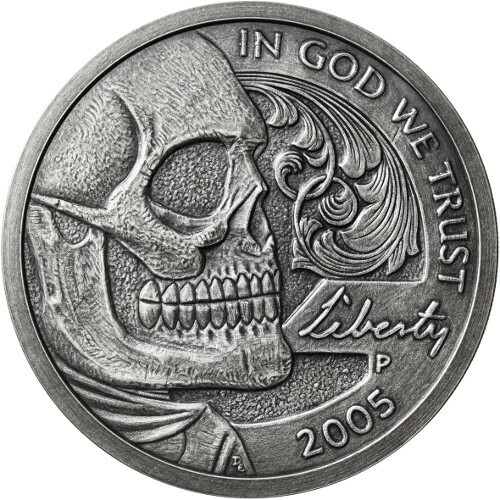 Obverse design showcases the new Jefferson Skull rendition. The Hobo Nickel Silver Round series contains a total of five different silver rounds with unique designs. Each design comes in two different finishes. There are 1 oz Proof versions of each design, as well as 1 oz and 5 oz versions in an antique finish. The final release in the Hobo Nickel Silver Rounds series features a right-profile portrait of a skull on the obverse; this design is based off the 2005 special-edition Westward Journey commemorative Jefferson nickel produced by the US Mint. 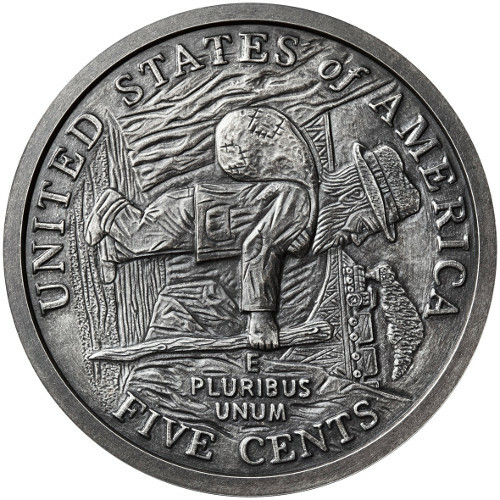 The reverse showcases a clever rendition of the Buffalo Nickel design. Mr. The’s design shows a vagabond with all his belongings walking in front of a train. These 1 oz Antique Jeffereson Skull Hobo Nickel Silver Rounds features a unique antique finish. The antique finish gives the round an older look and adds a bit of depth to the designs on the round. The edges of these rounds have unique serial numbers. Also included on the edge is the weight, purity and metal content of the round. Each of these Hobo Nickel Silver Rounds will ship with a Certificate of Authenticity that matches the serial number etched into the metal. The rounds will come in a plastic capsule, which helps protect the metal.